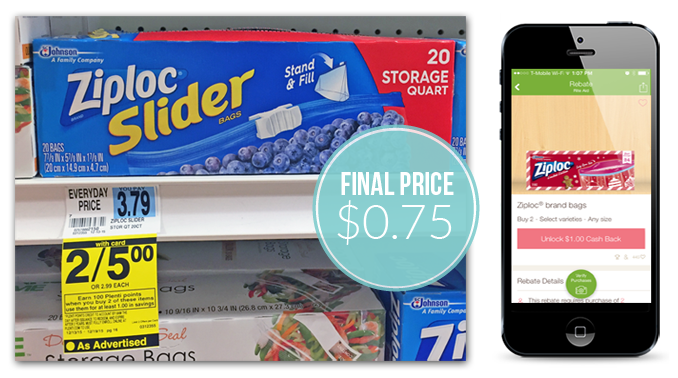 Score a nice deal on Ziploc food and freezer storage bags at Rite Aid! They are on sale, two for $5.00. Buy two and receive 100 Plenti Points which are equal to $1.00. Purchase two boxes and use one $1.50 manufacturer coupon. Before checking out, complete the activities to unlock a $1.00/2 Ziploc Ibotta offer. Pay $3.50 out of pocket and receive 100 Points. Later, the $1.00 Ibotta offer will automatically be credited to your account. The final price is $0.75 each! Total $3.50 plus receive 100 Plenti Points and Submit for $1.00 Ibotta Credit, making them only $1.50 or 75¢ each after coupon, points and credit!